…. was slightly disappointing as the two shorter ones lost marks for lack of length and my mentor did not really like my use of self-striping sock yarn on samples which cannot show off the full range of colours. I hadn’t thought of that but can see that these yarns need to be shown off in an item which does justice to the colour mix. So, having reworked the two offending braids I decided to have a go at Tunisian crochet, also known as Afghan crochet, which was completely new to me. Initially, I found working with the metal Tunisian hook (a timely freebie from Simply Crochet magazine) a bit hard on the fingers as was mastering the best way to hold this long implement. 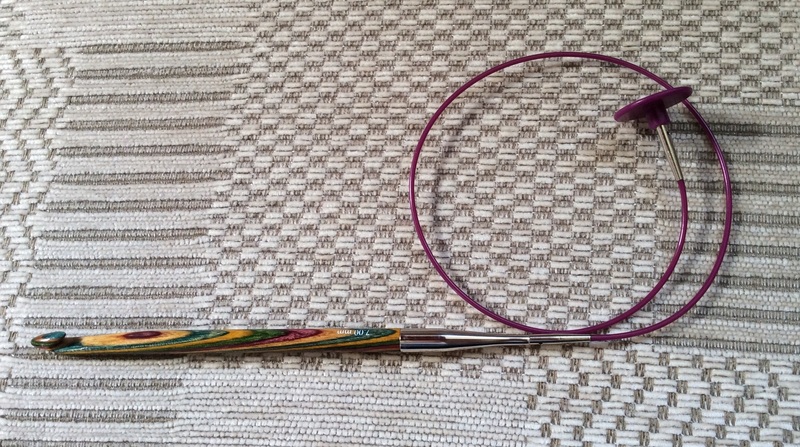 Things got easier when I realised that it was possible to get hold of a Knitpro Symphonie rosewood hook and attach it to the knitting cables which I already have. 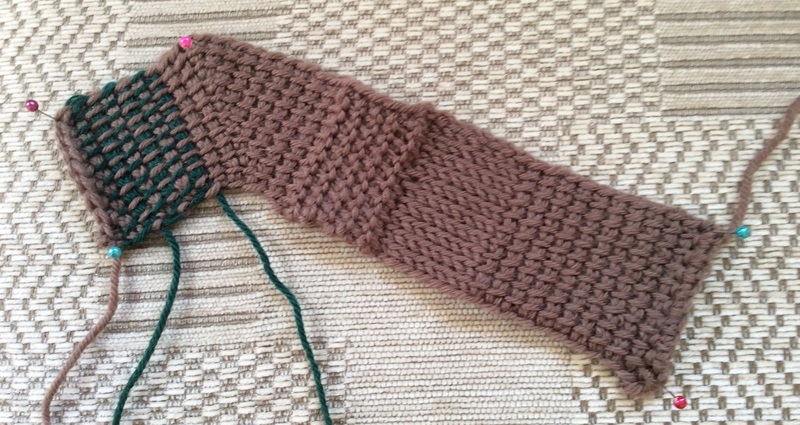 The technique is something between knitting and crochet – it involves picking up loops across a row of stitches and holding the loops produced on the hook. This is called the forward pass. Then the stitches are completed and the loops dropped on the way back which is called the return pass. Sounds much more complicated than it is! The fabric produced has a woven, dense texture and because it needs to be worked on a larger hook than one would normally use for the chosen yarn it grows quite quickly. Very fortuitously, I got onto a Tunisian Crochet workshop at Miju Wools, Gloucester, which gave me some more practice before doing my samples. 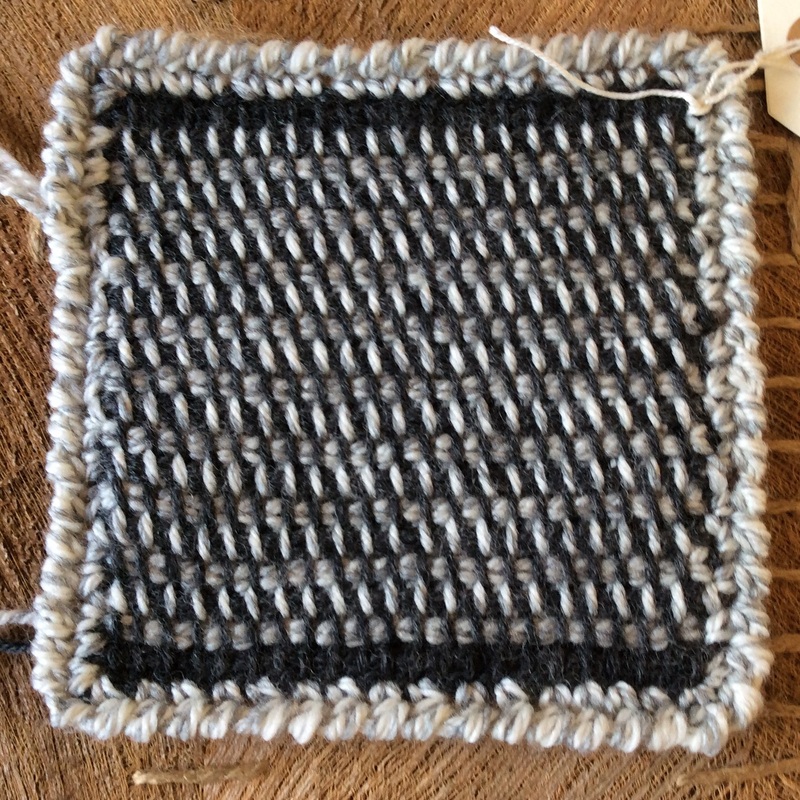 This sampler in DK 100% Merino wool gives an idea of the fabric …. …. this biggest issue for me on this one was achieving a straight left hand edge and I don’t think I’ll be starting on cross stitch any time soon! 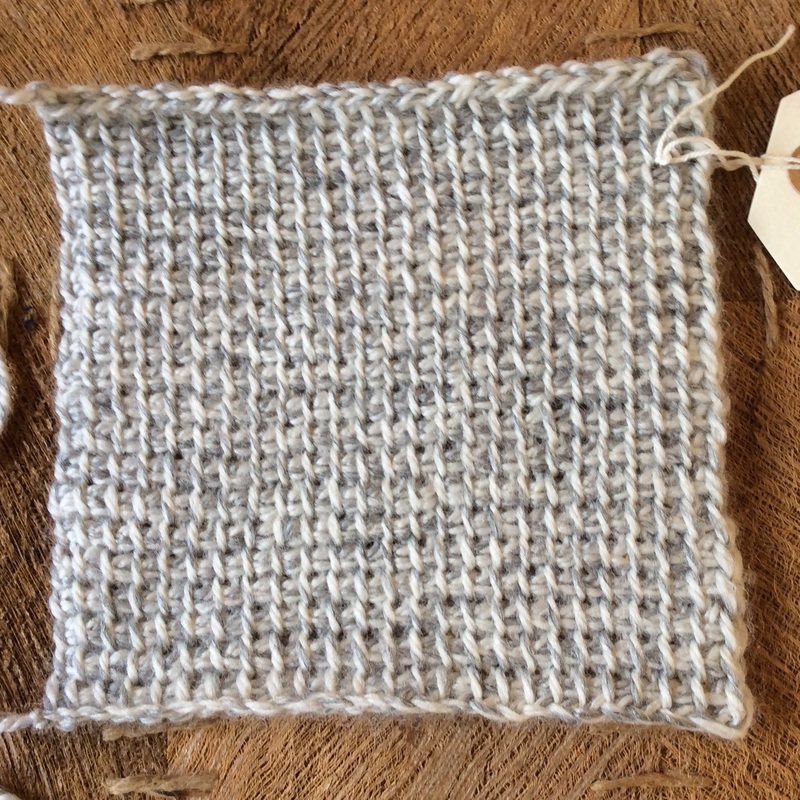 This square has also been edged with a round of dcs and crab stitch which, in fact, hides the uneven tension at the side – think I should have used a larger hook for these samples. The third example has to be of a textured Tunisian stitch and again the hardest part for me was achieving an even tension. 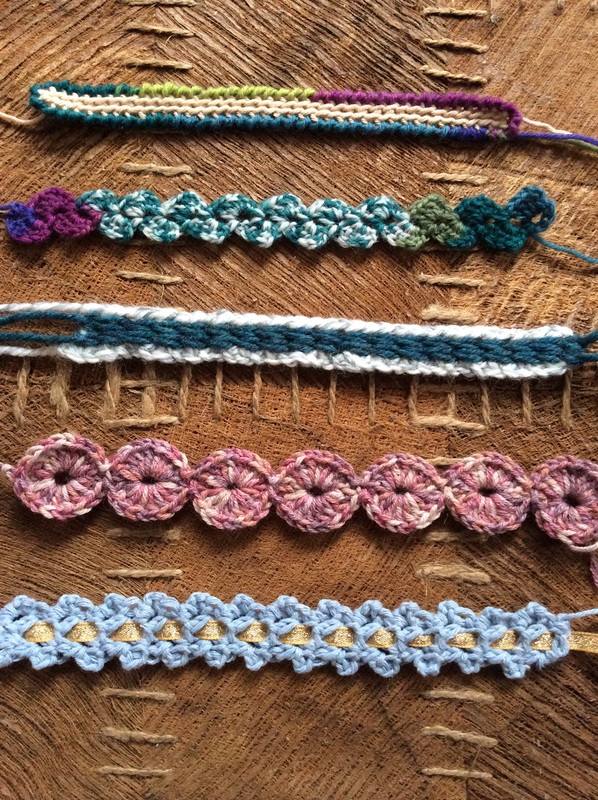 I finally decided on a bobble stitch as described in Pauline Turner’s booklet on Tunisian crochet and although I have submitted it – hence no photo at the moment – I’m less than hopeful that it will pass. So, I await the verdict on this fourth submission – hope to get it soon in order to keep up the momentum before summer activities such as gardening cut down my crochet time. The frosts of last week already seem long gone as we plan our first barbecue of the year.